Yesterdays game was my 25th game I have attended since I began this project. My fear was that I was going to get sick of baseball after a few weeks and then I would wonder how I was going to make it through 9 months. I am lucky that I have enjoyed all the games, people and places. Even though, some people have told me that I would be “hoping for rain outs”. Well, I had my first rain out this week and I was bummed out! While at the game yesterday I was with my two baseball buddies, Todd and Bob, as well as their kids. We are trying to add a visual element to Baseball Buddha and Todd is helping me do this by shooting a promo video for the website. My goal is to get him more involved with Baseball Buddha. I want to film the stadiums that I am attending and I need someone to edit to a reasonable length. Todd is also a baseball fanatic, I will profile him soon. He and his family are heavily involved with baseball. I met him at Starbucks the very first day that I was typing up Day 1 “Lonnie Burton”. He saw the Snowbird Baseball Classic program and inquired to what I was doing. He loved the idea, we have talked more and I think we can work something out. I was born on January 15th, 1934 on Ruggles Street in the Roxbury section of Boston, just a short walk through the Fenway Gardens on the way to the Fenway Park. 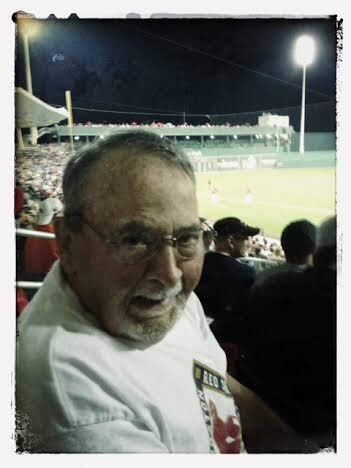 My first ballgame was with my Father as a 5 year old boy the summer of 1939. My Father was a life-long fan and saw his first game in Fenway, probably back in 1912, when he was about 14 year old. Sad to say my Dad didn’t live long enough to see the Red Sox win a World Series. I remember in my early teens, while my Father was away during the World War II, taking my Mother to Fenway Park for a Mother’s Day game. Later we lived in the suburb city of Malden, at the time and took the bus, elevated train and a trolley ride along Commonwealth Avenue to Kenmore Square and the short walk to the bleachers. Then I remember frequently making this same trip with one of my school friends throughout my teen years. I remember on game in particular, I was probably 14 or 15 years old, standing at the rail at the end of the Red Sox dugout behind first base during batting when Johnny Pesky cracked his bat and he came over and gave it to me. I remember the #6 on the handle. I had that bat for years, today I have no idea what happened to it. My favorite player was Ted Williams. When playing sandlot summer baseball as a kid, I always wanted to play second base as I also admired Bobby Doerr and wanted to be like him. I travel back to New England every couple of summers to see family and always take time to take in at least a couple of games at my memorable Fenway Park. I’ve eaten Italian sausages from every vendor on Yawkey Way and from the Sausage Guy on Lansdowne Street. I’ve also spent a tidy sum over the years at all the souvenir shops around the park. I sat in the left field grandstand for the 1999 All Star game. I attended the funeral tribute to Ted Williams in Fenway Park when he passed away. I attended the Ted Williams Hitters Hall of Fame induction ceremony here in Fort Myers. And yes I’ve been to and enjoyed Cooperstown, what a feeling to be there where all the great memories were stored. I was fortunate enough to travel to Boston for the first two 2004 World Series games in Boston with my son-in-law Rob Bentley. I’ve taken the tour of Fenway Park so many times I know the park like the back of my hand. I have a inscribed family brick installed at a Fenway Park gate C walkway commemorating my long time family history. I moved my family from New England to Fort Myers in 1962. I’ve been a spring training season ticket holder since the Sox arrived in 1993. Today I live in the Gateway area of Fort Myers which is within walking distance from the new Red Sox (JetBlue) stadium. I’ve attended most all the celebrations of the World Series Champs of 2004, 2007 and now 2013 here in Fort Myers and I attended the Grand Opening of the new JetBlue Park meeting Larry Lucchino while standing by the new home plate. 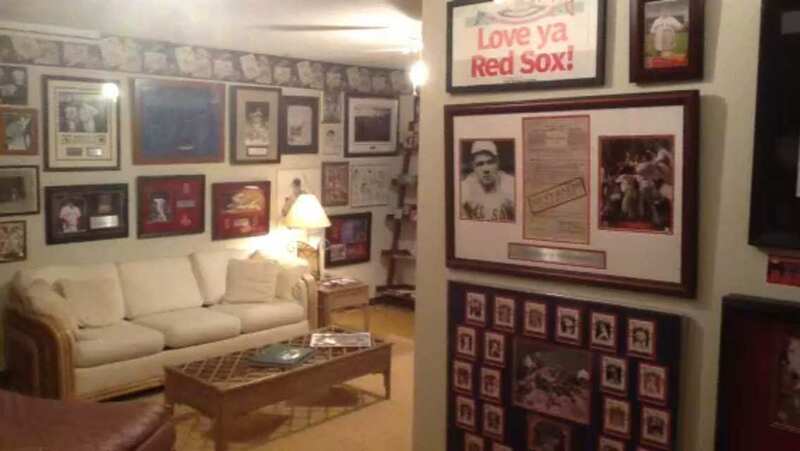 Over the years I have collected sizable collection of Red Sox memorabilia at my home that I seem to keep adding to every year. My family and I have lived in Fort Myers since 1962 and I am a fit and active 80 year old Red Sox fan and in fact, I can still pitch strikes from the pitcher’s mound. I’d like to ask you to arrange for me to throw the “ceremonial first pitch” at a game this Spring Training at JetBlue Park. I’m a season ticket holder, I’ll be at every game anyway so you pick the game and I’ll be ready. Just tell me date and time when you want me to show up. Thanks John for sharing and I hope you will get to throw out the first pitch at a Red Sox game soon! The promo video should be ready sometime in the next week. I also hope to have a video of McKechnie Field edited and up tonight, or tomorrow, so please check back and see that! I thank you all for your patience and understanding as I learn the ropes, I have been enjoying all of it! Pretty cool that John gave you his baseball “bio”! Priceless. Great work!